Tania is a nine-year-old girl that fell overboard and is now lost in the land of Skioria. Various races in the land are brought together to help bring her back to the land of humans, some of whom have to defy the conventions of their people in order to do so. It's a long distance to travel across Skioria, and the way is complicated by rugged terrain and storms. 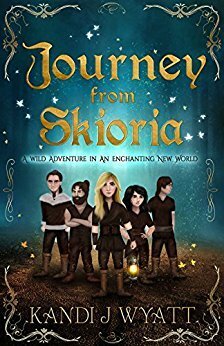 Journey from Skioria is a middle-grade fantasy novel and billed as a Lord of the Rings style of story. It does literally involve a mixed-race group of people united for a common cause, as well as travel across a large landscape on foot. The chapters are short, which should make it easier for younger readers, and it's easy to grasp what's happening. There are descriptions of the land and the folklore of the places, which would appeal to anyone interested in the topic. Tania comes across as a fun girl, even in a scary situation like this, and her personality shines as she learns about the different people and nations of Skioria. Everyone in the book bonds rather quickly and becomes so very emotionally attached, so that conflicts are resolved quickly. For younger readers, this is a benefit; Tania being involved in decisions and helping the adults will show children are capable of being leaders and reasoning out solutions to complicated problems. It's definitely an optimistic message and one that most children can absorb without even realizing it.